Surfer has been airlifted to hospital this morning ,****ing Noah's once again ruining a good surf session ! Rang my mate who is a regular there to see if it was him or if he had seen it however he was busy doing other stuff. Big schools of salmon this year reported so likely to be a few whites amongst them. Is that whale carcass washed up near lefthanders still there? Lets hope he is not too badly hurt and back again soon..
Long overdue for another cull, it worked last time, it will work again. Will we see surfer numbers plummet like last year as well? I was on the beach and watched the second attack. If you want to get attacked by a shark follow what this guy did. 2) Ignore the beach closure signs. 3) Ignore the DPAW staff telling you a 4m shark has been spotted. 4) Walk down the beach to where the dead whale is and paddle out there. 5) When the fisheries boat is yelling out to you that they have seen a massive shark and everyone else paddles in, you decide to stay out. BOOM 5 mins later you get nailed by a massive shark! Are there any photos of the surf? Photo in the "Australian" showing one of the guys stayed towing him into a wave to the beach what a legend. Saw a vid on fb this morning of a red board at the lefties stretch, decent bite mark. Not sure on the 4m estimate tho. Absolutely. Whats the general consensus down there Greenroom? Ooooh, a four letter word... No wonder I haven't heard it on the news. Massive props to the guy who helped out the first victim. Balls the size of watermelons! 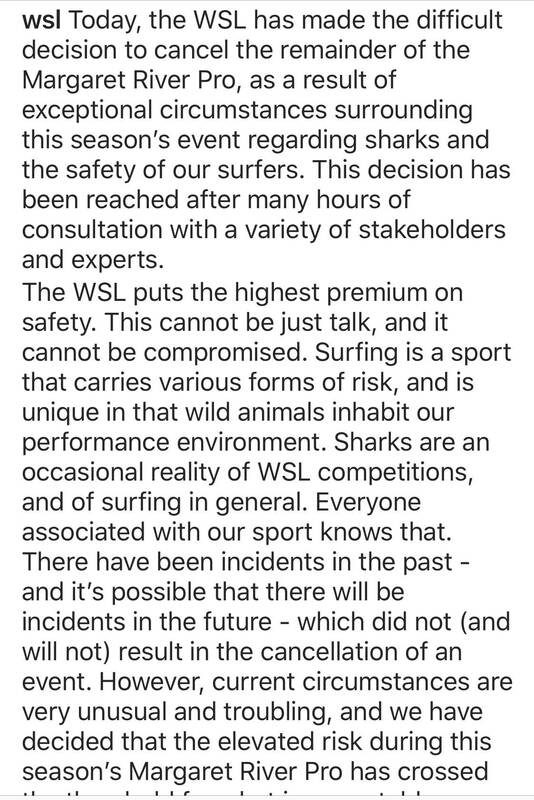 A mate was surfing Old Cobbles when the first shark attack happened. He saw the guy getting carried out of the water while he was waiting for a wave and thought that he must have just hurt himself. Then he said about 4 girls were on the hill waving their arms and screaming but couldn't hear exactly what they were saying but paddled in anyway. He's a little rattled by it as we were both surfing there at the same time when Chris was killed at Umbies. We both knew Chris. Also knew Nick from the South Point shark attack. Its all too close to home. Yep we all surf and everyone who does makes the trip south. But I don't think you blokes really comprehend the frequency as it's not a daily task for you guys to paddle out at these breaks. Yes it's insane! It's crazy! I've got so much running through my head. I was salmon fishing at Booj a couple weeks ago and a shark cleared everyone from Gas and the beach. About halfa hour later 2 whites smashed the salmon school I was fishing. Insane to see. The ocean is alive and fully active. We see sharks all the time. Surfing, windsurfing, fishing, chillin' whatever. I had one only a few months ago swim past me with fin out and 3 blokes on the beach saw it and started yelling and screaming at me. Not a good place to be in. I've seriously lost count. It's just something you gotta expect now as the norm. Bull**** aside, let's not call it a cull, let's call it a controlled fish! They aren't endangered anymore. My experience alone tells me otherwise and I'm not the only one living down here. Come on fk me! This is my opinion and pretty sure the same opinion of most Gracetown/Cowaramup surfer's. We all have kids who surf and I'm afraid that my son or daughter will be next. Crocs, kangaroos, rabbits, foxes, horses etc get culled. Rant over, more bourbon needed! Our beaches are now formally fringed with a blood-red line, the far side of which we are 'game' for monsters of the deep. Cancelling the pro may well finally have an impact on our $s over people state government. The impact on tourism $s will be massive as this will go right round the world and label Margs as a no go for many would be visitors. It might just force some more visible action on the problem fingers crossed. Just thinking out loud here..
Would the event have been cancelled because of the first attack if there hadn't been a second. If not, then was the second attack/ incident the impetus for the cancellation. 2 an anode like sentinal, in that he would keep the shark away from the competition, and therefore aiming to keep the comp going? Either way, a speedy recovery to 2 pretty lucky (they survived) and unlucky (they got bit) surfers. Insurance matters and wobbly Brazzo's likely the cause. Isn't the reason people move to Margs is for the countryside and better waves or is it for being overrun by tourist clogging the breaks up like the Gold Coast? Has it all changed that much since I was a rate payer down there? the event was cancelled due to ongoing shark activity on top of these 2 quick fire attacks. the alerts are pinging like crazy with sightings last 48 hours. ie it wasnt looking like getting any better. Inadvertently or not if the cancelled pro jolts some action from McClowan then that 2nd bloke is a bloody hero in my book!